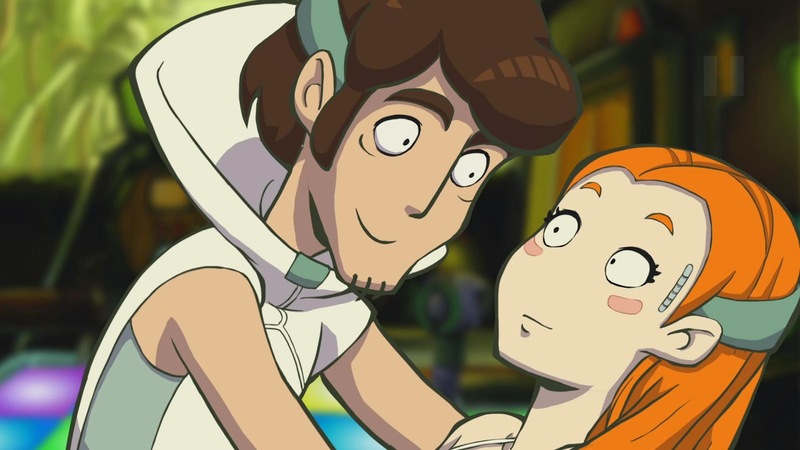 The Deponia series has been a beautiful collection of adventure games spanning three different releases. Deponia: The Complete Journey brings these tales together with several extras to create the definitive experience of these award-winning games. The animation is beautiful as always (I would expect nothing less from Daedalic Entertainment), the story is charming and the characters quirky but easy to invest in. This is an adventure game for the PC absolutely worth experiencing. It is sometimes difficult to write reviews about games where the story is the key element. I hesitate to talk too much about plot, for fear of giving away any significant, spoiler-like details. 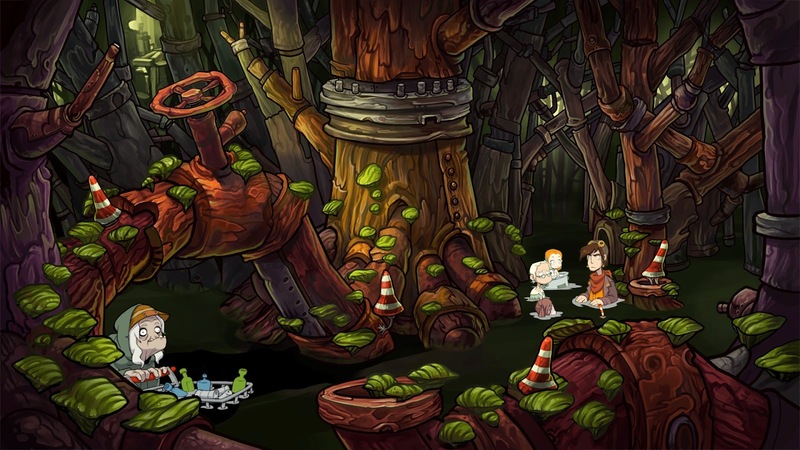 Deponia is a planet planet overflowing with junk. It is a tired, bleak existence and this series of stories follows the adventures of Rufus, our intrepid hero who in his attempt to escape the planet encounters a beautiful woman named Goal. Predictably he falls in love, but of course it would be a short story if everything went happily ever after from that point on. This is anything but a short story, as the three games offer up dozens of hours of gameplay. Comical, improbable but completely enjoyable hijinks follow. The art direction is absolutely top-notch. Daedalic Entertainment has a well-earned reputation for their beautiful, painted visuals. Deponia is more than a pretty planet full of junk (an oxymoron if ever I heard one) the dialogue, puzzles and story also more than hold their own to round out the experience. Deponia: The Complete Journey is worth having in your game collection in and of itself, especially if you are a fan of adventure games. That being said, this version of the title comes with over four hours of dev commentary, an updated quest system, brand new collectables, new songs and more. That is a lot of love from the development team, and hearing some of the commentary and understanding just how different this series of games could have been was fascinating to me. There is a focus on humor, delivered by hours of excellent voice acting and complimented by a gorgeous soundtrack. The comedy could be seen as a bit crude at times, with a sort of slapstick quality to it. More than that though, this is a love story - just one told in a unique way with characters that I found to be incredibly memorable. The story is often unpredictable, making it a joy to play through the various twists and turns when they surprise from out of nowhere. The series has been around for some time, and many people own some or all of the three games. The way it is handled when purchasing on Steam is that you get a discount for each of the three games you already have (of 30%). If you own all three titles, you get a whopping 90% discount. Of course that may not be reason enough for some people to purchase this re-bundled package, but those extras were certainly worth it to a fan of the series such as myself. 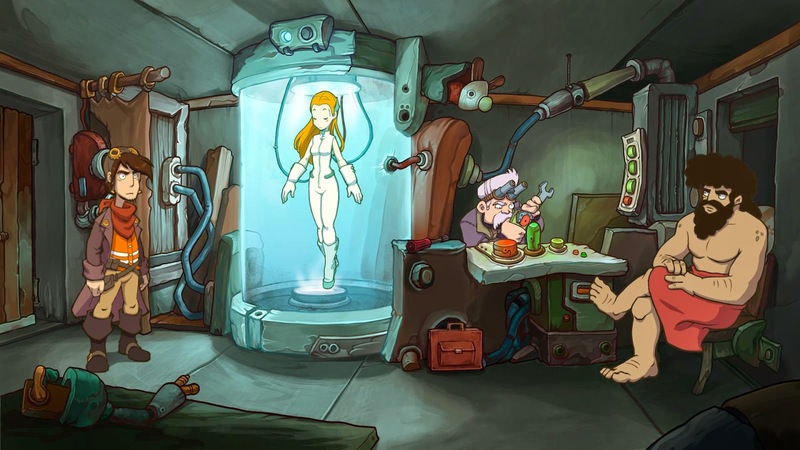 Deponia is a part of the tried and true point-and-click adventure genre that still feels fresh due to its amazing production values, truly challenging riddles and puzzles and loveable story and cast of characters. If you are looking for a high-action platforming or shooting experience, Deponia: The Complete Journey will not scratch that itch. If you are looking for an engaging narrative that unfolds at a slower, more methodical pace, it is hard to do much better than this.